Besides the fabulous Love Story paper, I also used some BFS chippies. In this closeup, you can see the rings panel portion peeking form the right side of the layers. I used some pink, red, and black chalk inks, blending them on the chipboard. And, I used the majestic frame under the picture. I painted it with black embossing paste, and added some Prima Art Sugar in silver. Here's a closeup that shows the bottom of the majestic frame and part of the romantic page heart dangle. I just sponged on three colors of Inka Gold for that effect. Lastly, I added the "Happy" title. I treated it with Prima Art Sugar in pink, but all of the pictures I took have it washed out to a white color. Thanks for stopping by and checking out my take on the sketch! Your layout is very gorgeous. Me too, I love this paper. Good luck ! Wow, I love the way you have altered the chipboard pieces on this beautiful layout. 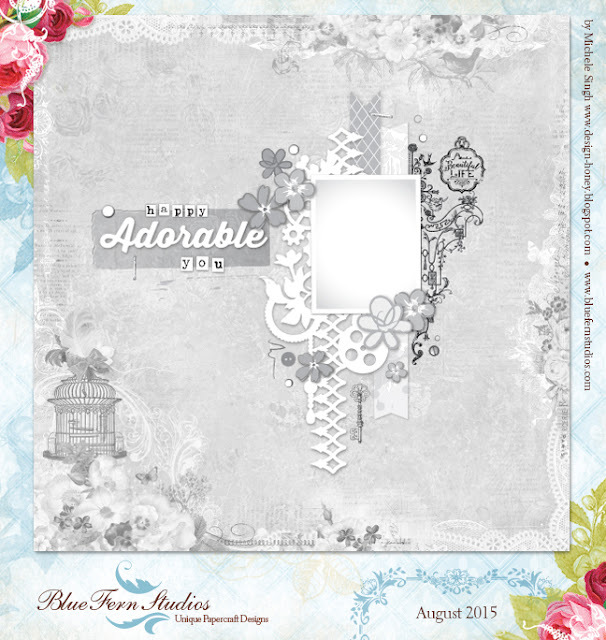 So glad you could join us at Blue Fern Studios for our sketch challenge this month. Stunning!!!! I love the background stenciling and all of your varied chipboard treatments; Your layers of cut and punched strips in the background bring out your photo perfectly!!! !